Manchester United to sign Belgium defender in January? Manchester United could reportedly step up their interest in signing long-term target Toby Alderweireld when the transfer window reopens in the New Year. The Belgian came close to joining the Red Devils during the summer but ultimately stayed put with the club failing to reach a transfer agreement with Spurs. However, this has not ceased the speculation and according to The Sun, United could come with a fresh approach next month with Jose Mourinho being allocated funds to strengthen the backline. The 29-year-old has just seven months remaining on his existing deal with Spurs but the club have the option to trigger a 12-month extension, should they wish to do so. Still, the clause has a disadvantage, given the defender would be available for a cut-price fee of just £25m during the final two weeks of next summer's transfer window. 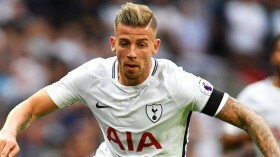 Alderweireld has been a regular feature for Spurs during the course of the current season but he was surprisingly dropped to the bench during the recent derby defeat to Arsenal.